Sony may describe the A7 III as its ‘basic’ full-frame model, but in truth, it’s anything but. Built around a stacked 24.2MP Exmor R CMOS sensor and a BIONZ X processing engine, it offers enthusiasts and professionals a range of advanced features that are usually only found on more expensive devices. The company claims that the new sensor offers up to 1.5 stops better noise control over the A7 II, as well as 15 stops of dynamic range at low sensitivity levels and more accurate colour reproduction too. A speedy continuous shooting speed of 10fps is possible with both autoexposure and tracking, which makes it highly adept for sports and wildlife use, while the camera’s 5-axis image stabilisation system can compensate for up to 5 stops of shake, meaning that sharp handheld shots are easier than ever to achieve. Plucked from Sony’s flagship A9 is the A7 III’s blisteringly quick 4D autofocus system. 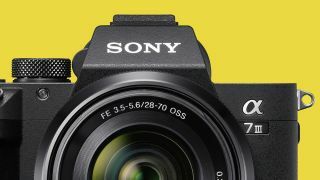 Touting 693 phase-detection AF points that cover 93% of the frame and 425 contrast-detect AF points, Sony reckons this hybrid focus system is twice as fast as the one inside its predecessor, and can keep pace while tracking tricky subjects with ease. Video specs are also very credible. The A7 III boasts internal 4K recording with no pixel binning at 30fps, as well a Full HD shooting at up to 120fps for super-slow-motion output. Inputs for an external microphone and headphones help the user to ensure professional audio capture, while S-Log 3 and Hybrid Log-Gamma profiles are also both supported. A slightly larger form factor than its predecessor has also given the well-built A7 III better ergonomics, with space for two SD card slots around the side. Just as welcome is the larger battery, which provides a charge capacity of 710 shots (when using the LCD screen, rather than the viewfinder). Sure, it's not quite up there with pro-level DSLRs, but the fact that it's a significant improvement on the A7 II's 340 shots per charge shows Sony to be making changes where it matters.